Over the past 8 or so years the cloth diaper industry has had an amazing increase in the brands/style of one-size cloth diapers. Don’t get me wrong….one-size cloth diapers are a ‘must-have’ when you cloth diaper but quite honestly…they will not fit a newborn that well. If you are trying to use any brand of a one-size cloth diaper on an average size newborn (7 lbs. 8 oz) you can easily get discouraged with fit issues… which ultimately leads to leaks….and you do NOT WANT LEAKS. If you are using cloth diapers for the first time you will easily get discouraged if you do have consistent leaks and you might just give up on cloth diapering all together. This is why I think there is a great need for newborn cloth diapers and it is worth the investment! The Imse Vimse All-in-One Cloth Diaper in Size Newborn/Preemie is an easy to use cloth diaper made with high quality, certified organic materials. 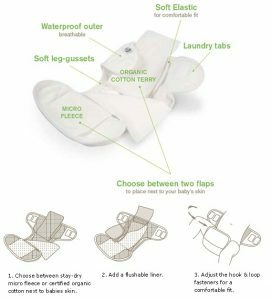 Quick-dry design: This cloth diaper is designed to be a quick dry cloth diaper. There are 2 rectangular ‘flaps’ inside the diaper. The first flap is sewn on the inside front edge of the cloth diaper. It is a stay-dry fleece sewn on top of 100% organic cotton. The second flap is sewn on the inside back edge of the cloth diaper and is 100% organic cotton. Instead of being sewn on all 4 sides each ‘flap’ is only sewn on one side. This way the flaps can agitate in the wash making the diaper very easy to clean. The problem with some all-in-one cloth diapers is that all layers are sewn and this creates an extremely long drying time and it is an environment for bacteria to breed if for some reason the diaper doesn’t get cleaned or dry enough. Umbilical cord notch: The diaper is designed with a gentle scoop-down on the front panel to accommodate those first couple of weeks where the umbilical cord can be attached. Gussets: You will find gussets on this diaper and these are a MUST-HAVE when diapering a newborn. Newborns can have explosive bowel movements. Who could have thought that a tiny baby could produce so much ‘stuff’? -lol. 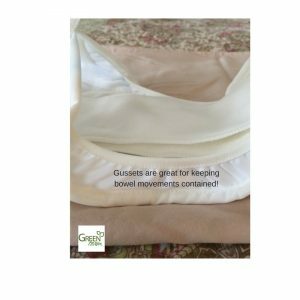 The gussets are basically a ‘wall’ to keep those runny bowel movements within the diaper and not going all over that adorable outfit you have been waiting to put on baby. Just like a disposable: For you ‘seasoned’ cloth diapers this is not a big deal but when a partner, grandma, or daycare is changing baby…this cloth diaper is a breeze. Quick changing…yes…just like a disposable. Customizable: I love this diaper because you can add an extra insert or newborn prefold diaper to increase the absorbency. Just lay the insert underneath one of the flaps. This entry was posted in Blog and tagged #makeclothmainstream, all-in-one cloth diaper, imse vimse, product review. Bookmark the permalink. This was a great diaper for us to start our stash! The fact that it was hook and loop and went on just like a disposable made it easier to get Dad on board(Grandma liked it too)!